The Los Angeles Street Culture of Crips and Bloods have affected the United States population, all the way into America's Pop Culture. Blue and Red, identifying colors that symbolically distinguished two opposing neighborhood groups. Since the 1970s Gangs have become a relevant social ill, globalized into the new millennium. Watch this blog-ver-sa-tion of details, as it explore Urban America in depth. Stacy Peralta, famed skater and one of the founding-fathers of skateboarding, directs a true epic story - documenting the Los Angeles gang culture and street life. 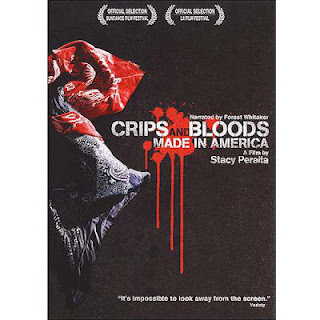 This doc internalizes root causes of the Watts' Riot, the departure of economic sustainability, and the enormous aftermath that followed, a narration of "Crips and Bloods Made in America." For those who may not understand or always wanted to know about systematic root causes of a problem, that is now a world issue. Watching this will shed Some light, but not all. Create-A-Voice recently explored Music in Politics, Music-Politics and Crack; and now Crips and Bloods. Mainly for our audience to extract the Wisdom, the What, the When, the Where and Why. Hopefully those five W's can ignite healing for our communities. One Hour, Thirty-Three Minutes and Six Seconds of Patience to internalize a reality.